Back in September Nadine from Sparkle Pr kindly sent me the 100% Natural Australian Jojoba Oil to try and I'm so glad I did. This oil has made such a difference to my skin, especially having dry and sensitive skin and Eczema too! I had heard of Jojoba before but I never knew what it was until Nadine approached me when I then did some research into this oil. "Pure Jojoba is so incredibly versatile, gentle and safe for all skin types that it is the ‘go to’ bottle for many skin needs. As the only plant in the world known to produce a wax similar to our own skin’s sebum, it is able to penetrate deep into the skin. These ingredients nourish, soothe and deeply moisturise. Jojoba’s unique structure means it is non- greasy (it is not an oil), and is very quickly absorbed." I love this JoJoba Oil because it's scent free! 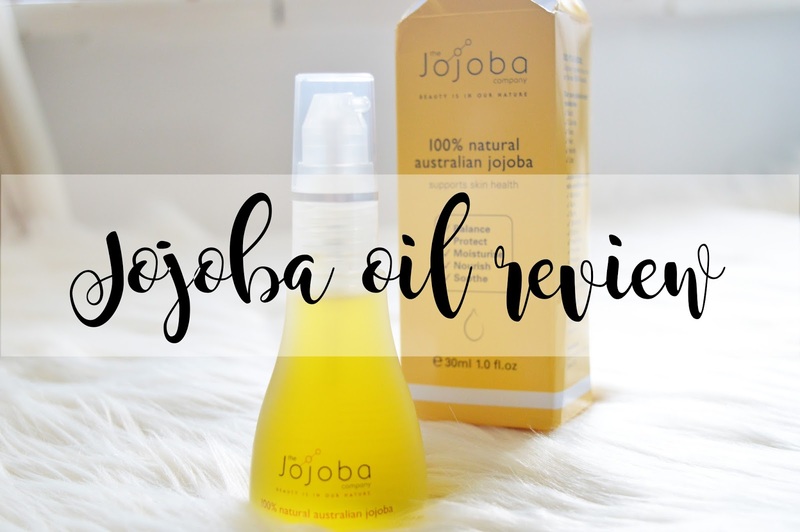 Sometimes you can find an incredibly amazing oil, but it has the most disgusting smell you'd ever smell, but this isn't the case with the JoJoba Oil! As well as this, although it is called the JoJoba Oil, it isn't actually an oil; it is a liquid wax meaning it isn't greasy on the skin which is perfect for if you're using this as a face moisturiser. I have been especially using this on my legs as this is the dryest area of my body and it has worked wonders! This product has lasted all day on my legs and by the end of the day, my skin still isn't dry and flakey. (Apologies for TMI). But you can use the JoJoba Oil for your body, cuticles, face, hair, hands and lips. What a multi-purpose product with so many benefits! I have also just found out you can use this as a makeup remover, oh my! How did I not know this beforehand? I am definitely going to give this a go. I also love the packaging of this product, the way the box opens is incredible; I have never seen anything like it! Not only is the box a beautiful design, but how the colour of the box represents the colour of the liquid wax is so aesthetically pleasing and definitely a selling point for this brand! Overall, I absolutely love this Jojoba Oil. Not only does it keep my skin moisturised, but it also keeps it nourished and it soothes it at the same time! Everything you need in a daily moituriser or skin protector! No matter where you use this product on your body, you will be able to see the benefits from it! Unfortunately having to suffer with dry, sensitive and eczema prone skin it can be rather difficult finding skin care products which do not irritate my skin but this has shown me not all products are going to cause a skin reaction and I can start to be more adventuous with my skin care routines! You can also pick this up in Holland & Barrett to save shipping it over to the UK! I've been looking for a super moisterising product this winter for my dry and eczema prone skin! Looks like I've found something to try! I've never used 100% Jojoba oil but I have used products that contain Jojoba oil. I love trying out new oils. PS Your photography is on POINT!